Too often as marketers, we consider churn a bad thing. 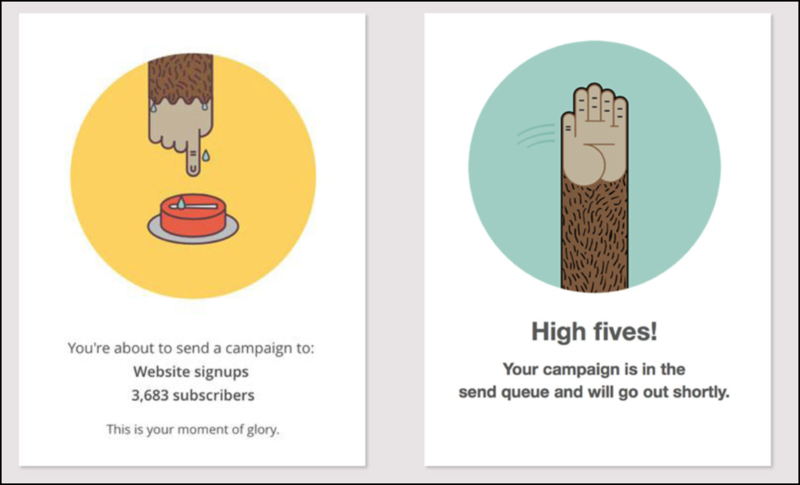 So we design our SaaS offboarding process in a way to trap our customers into staying. However, there’s a better way to do it. And that’s with transparency. 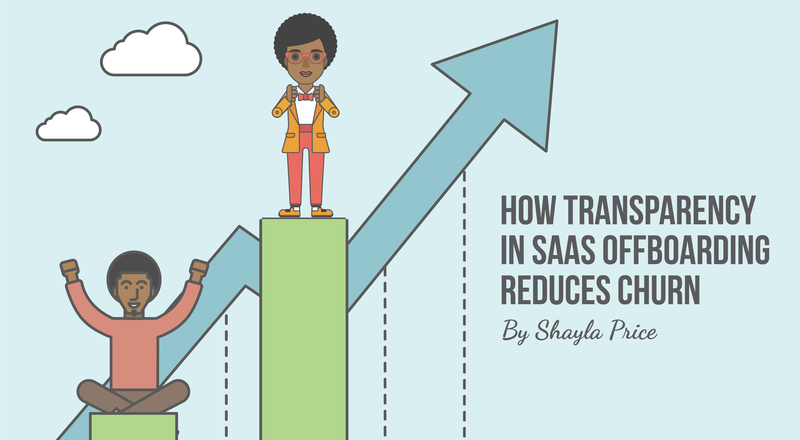 SaaS offboarding is a gut-wrenching reality check to serve your customers better. Below are five ways to add transparency to the process. Making it difficult for customers to cancel their services is a big no-no. They won’t miraculously stick around because of your unwillingness to let go. The opposite will happen. Churning customers will leave your business and will feel justified in their decision to do so. On top of that, they may spread the unpleasant news with their social network of friends and family members. To prevent the public embarrassment, your team should build an offboarding workflow or cancellation workflow. It’s a sequence of steps that a customer must take to cancel their SaaS subscription. 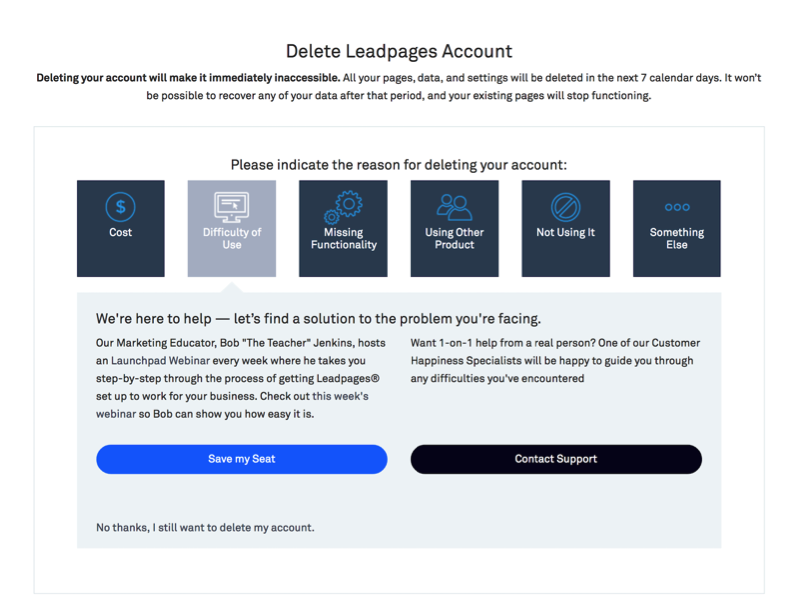 Below is an example from Leadpages. 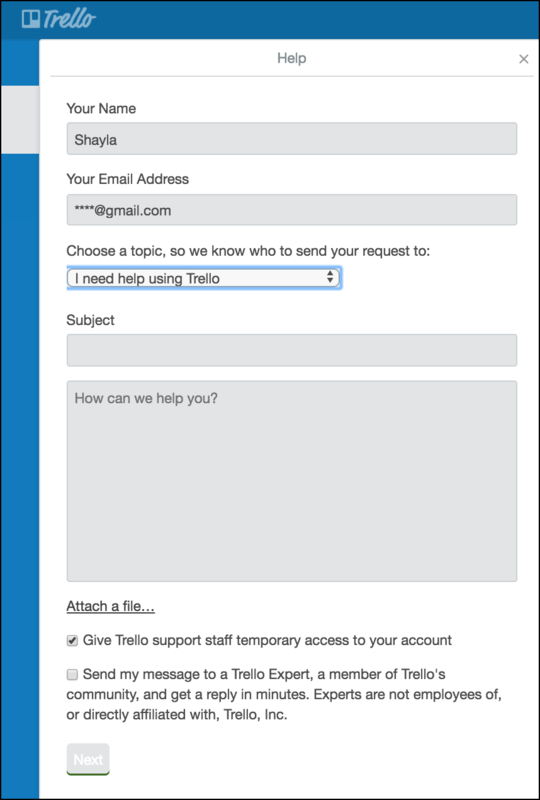 When users want to delete their accounts, they land on a multi-option workflow, allowing them to select a reason for cancellation. Each option counters the customer’s reason for leaving. For instance, selecting “Difficulty of Use,” let’s the user sign up for an educational webinar or contact support. More importantly, there’s always the option to delete the account. This offboarding workflow mitigates churn by offering a solution to the customer. It also gives your team essential feedback to understand why customers churn. That way, you can go revisit your onboarding process to fill in any gaps in users’ expectations. Once users sign up for your product, you can’t leave them stranded as they attempt to figure out your platform. 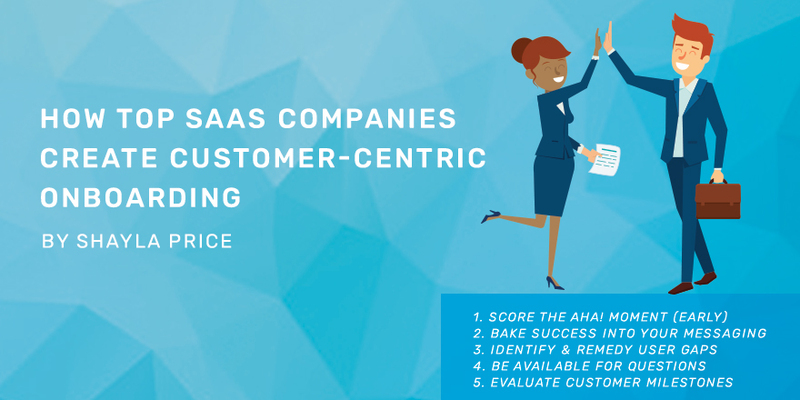 Focusing on customer success entails educating users every step of the way. Customer success should play an integral part in offboarding, too. You don’t want to kick users to the curb just because they want to cancel. Instead, you want to educate customers. You may have to address why they feel their current needs aren’t being met. Or you may highlight their alternative options if they decide to churn. This educational approach puts the customers’ needs first. It also doesn’t abruptly end the relationship. Because you never know, the user may decide to buy from your SaaS business again. Ever customer relationship won’t end with users becoming lifelong brand advocates. And that’s okay. What’s not okay is failing to prepare for cancellations. Some users will want to deactivate their accounts immediately, and others will want a full refund. While some user scenarios may call for a case-by-case review, most cancellations should follow a standard guideline. The key is to create a cancellation policy and make it easily accessible to your customers—without the unnecessary hassle. Before developing a policy, you’ll want to consult with a local business advisor or legal professional. Their expertise will ensure you’re not violating any laws and are adhering to common business practices. The next step is to find a happy medium between your company and the customer. How can you maintain a viable business and satisfy your customers’ expectations? Transparency is all about empowering your users to make informed decisions. Customers then can determine what works best for their situation. Making your policy readily available is a part of enhancing the customer experience. Some SaaS companies treat churn like a taboo topic. If they don’t talk about it, maybe it won’t be a real issue in the future. Well, that’s the wrong mindset to possess in offboarding. Consider churn a chance to have an honest conversation with your customers. Email marketing helps close the feedback loop with churning customers. You can send a message inquiring about their experience with your product. You also can send multiple emails—without being annoying—if a user fails to respond. 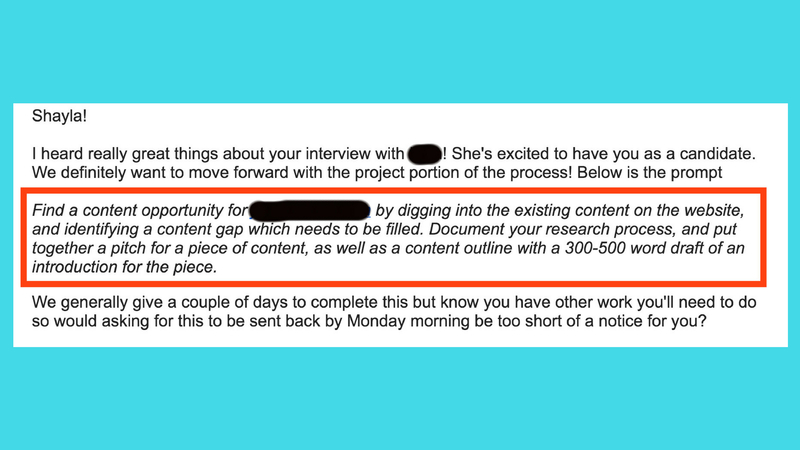 Check out the feedback request email below. 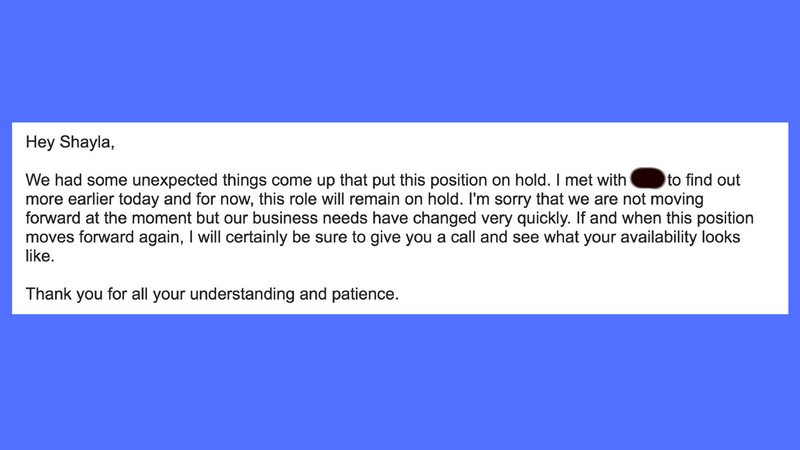 Baremetrics doesn’t shy away from asking customers why they decided to cancel. Use email as a tool to gain pertinent details from churning customers. Be straightforward with your ask and keep the request short. You don’t want to bog users down with lots of questions. While mending parts of your marketing and sales funnel is helpful, it’s only a short-term fix to your long-term challenge. You want to bake your goal of reducing churn into your overall business strategy. Throughout the entire customer lifecycle, your team should be observing and requesting feedback from your users. This undertaking translates into prompting new users to tell you why they signed up for your product, monitoring usage data to understand the most frequently used product features, and giving users a chance provide candid feedback after churning. 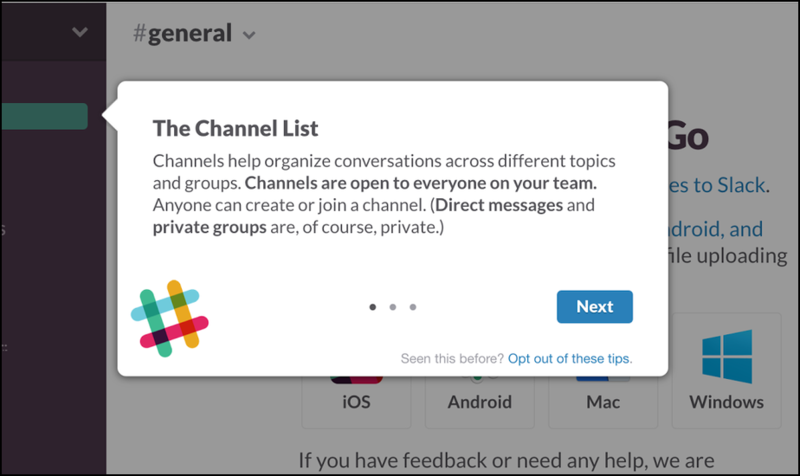 Combating churn means taking a proactive approach to talk with your users. It also requires transparency on how you will use those conversations to their benefit. Rather than concealing the value-added process from users, be frank and take them along for the journey with blog post updates and in-app notifications. 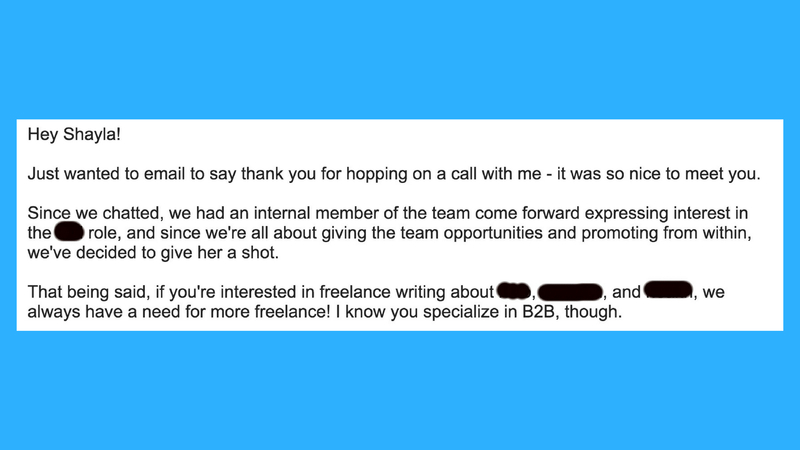 In offboarding, your team can learn how to help both current and future customers. It’s an opportunity to reevaluate your path to achieving customer success. Take advantage of churn by collecting insight in the offboarding workflow. Just make sure you offer transparency throughout the whole process.